Always missing those Eli Hops? Can&apos;t seem to nail those string tricks because your yo-yo is just too slim? Well those days are now going to be a thing of the past. Introduction the Super Wide from Yoyofactory. This yo-yo is bound to change the way one views yo-yos yet again. in 2010, YoYoFactory has ventured into the realm of the super-wide profile. At first glance, the SuperWide has such an unusual shape you may not recognize it as a yo-yo. The body shape is designed to stretch the limits of what&apos;s possible with a yo-yo, and its name is as descriptive as you can get. 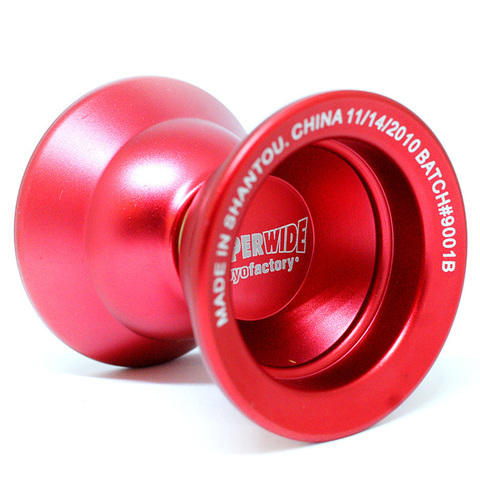 The width of this yo-yo is above and beyond anything else available, including off string models like the Fiesta and Kamui. The ease of landing the SuperWide on the string is something you just need to feel for yourself. Executing more complex string tricks takes some practice, making the SuperWide a great test model for getting those next-level tricks, and perfecting your technique. With its unusual shape, even doing standard tricks, you may catch the string or hit the yo-yo with your finger at completely unexpected times, giving you a sense of bewilderment and a whole new appreciation for those tricks. But that feeling may only last a short while, for once you become acquainted with the SuperWide, you&apos;ll realize just how powerful this yo-yo is. Its ridiculous stability will make it hard to part with, and its potential will have you challenging new tricks you never thought possible. Of course, due to its outrageous shape, the SuperWide has a few peculariarities, but that&apos;s why we want you to try it for yourself. Whether it becomes your closest ally or your worst enemy is up to you. Extremely different feel for this yo-yo, a must get!